Mrs Britain had been banging on about Dornoch Cathedral almost since the time we first met. A relative had been married there and it had made a deep impression on her; you know how young girls can be. Its only other claim to fame, as far as I could make out, was that Madonna and Guy Ritchie had their son, Rocco, baptised there in 2000, the day before having their wedding somewhere else, inside the security of nearby Skibo Castle. Anyhow, there was a tacit understanding that, someday, Mrs Britain and I were going to see Dornoch Cathedral, the most northerly cathedral on the British mainland. The opportunity arose when visiting friends in the Highlands, bolting one of A Bit About Britain’s epic fact-finding tours onto this. It was a mistake to imagine that dropping into Dornoch would be a simple matter of looking at a nice medieval cathedral with, perhaps, a coffee and bun to follow. For starters, Dornoch is one of those places you pull into and immediately think, “Oh, I like this, I need to stay awhile”. Then, there’s the unexpected history; though why that should be a surprise was foolish of me, because everywhere has a history. Moreover, places with cathedrals and castles tend to be more obvious about their heritage and Dornoch has both of those things. Mind you, the castle is now a hotel. While we’re about it, the cathedral isn’t technically a cathedral either, because since the Scottish Reformation it has been taken over by the Church of Scotland – which does not hold with bishops: thus cathedrals are not required; surplus, you could say. 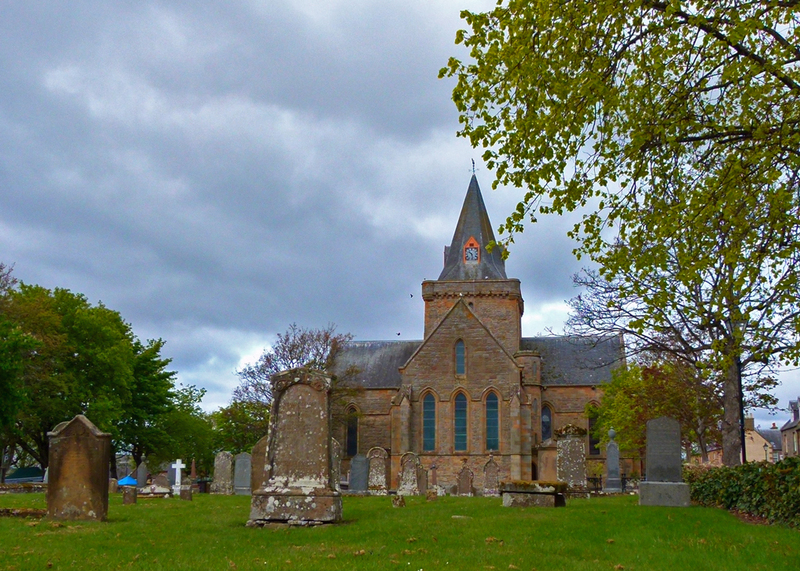 So Dornoch Cathedral is in fact a parish church; the term cathedral has just been retained for old times’ sake – and I’m sure it doesn’t do the tourist trade any harm. 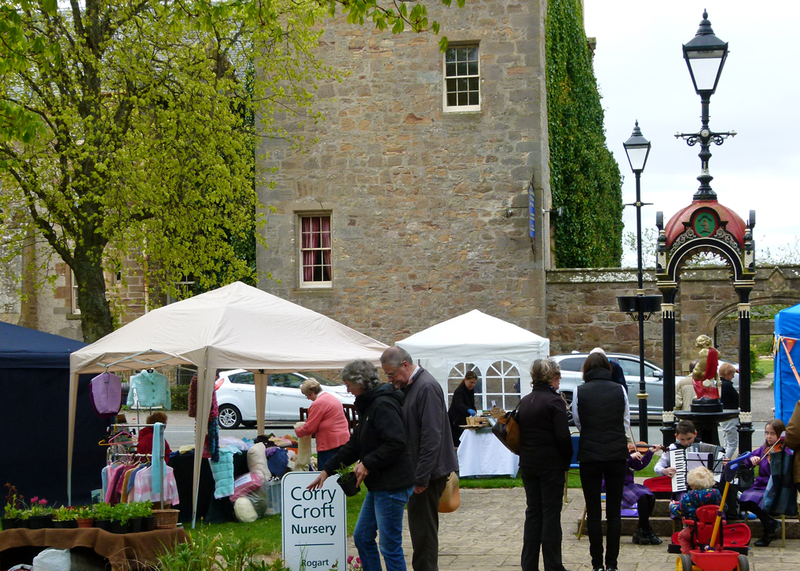 There was a market in progress in the middle of Dornoch when we arrived, on the green between the Cathedral and Dornoch Castle Hotel. Castle Street is attractive, widening gracefully at one end. The Castle Hotel looks typically Scottish baronial, a bit of an assortment of styles; the cathedral, partially obscured by trees, at first glance appears a little squat, unremarkable and relatively new. The market presented a bustling, but not overwhelmingly frantic, scene. Appetising-looking food stalls rubbed shoulders with domestic paraphernalia and children played fiddles and accordion by a gaudy Victorian drinking fountain. There was a friendly, carnival-like atmosphere. The nearby shops seemed neat and affluent, the people happy and healthy. 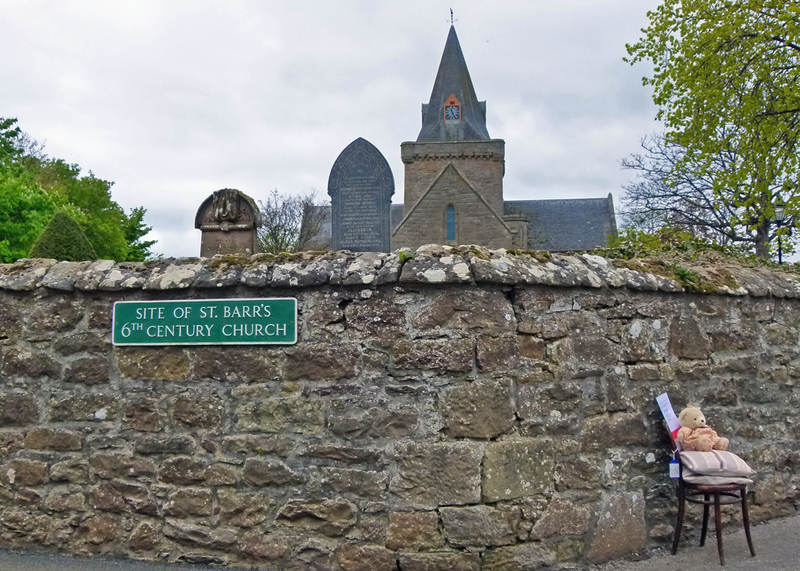 Our first tentative brush with the past in Dornoch came in the form of a no-nonsense sign on the wall of the cathedral’s cemetery which, unemotionally but intriguingly, read: “Site of St Barr’s 6th century church”. From what I can make out, when the cathedral was being a cathedral, St Barr’s became the parish church. It fell into disuse in the 15th century and seems to have been demolished in the 17th. St Barr, or Finnbarr (he had various names), was a 5th century Irish saint who spent time at St Ninian’s Whithorn Priory and clearly did Good Things. Worry not; since the early 20th century, there has been a St Finnbarr’s church in Dornoch once more (Scottish Episcopalian). 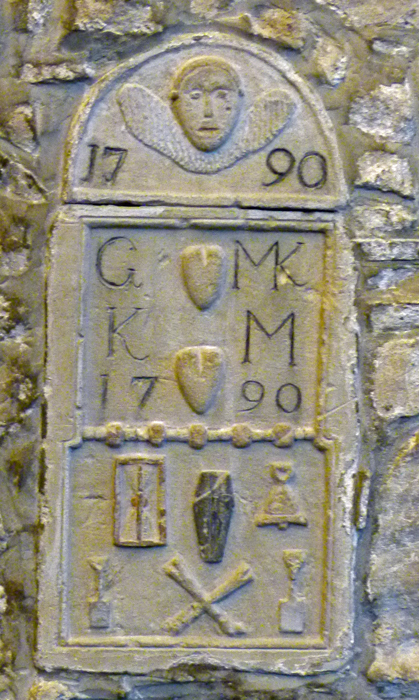 Further along the kirkyard wall we came across an ancient mercat (market) cross, looking very sorry for itself. A useful information board revealed that weekly markets have been held in Dornoch since at least medieval times and that by the 18th century seven annual fairs were being held too. These came to an end, apparently, in the 19th century when the town council built a wall round the cemetery, where the fairs had taken place, to keep roaming pigs from rooting at the deceased. Nevertheless, I got a nice warm feeling about the market being a symbol of continuity with what went before; it was like walking in old footprints. 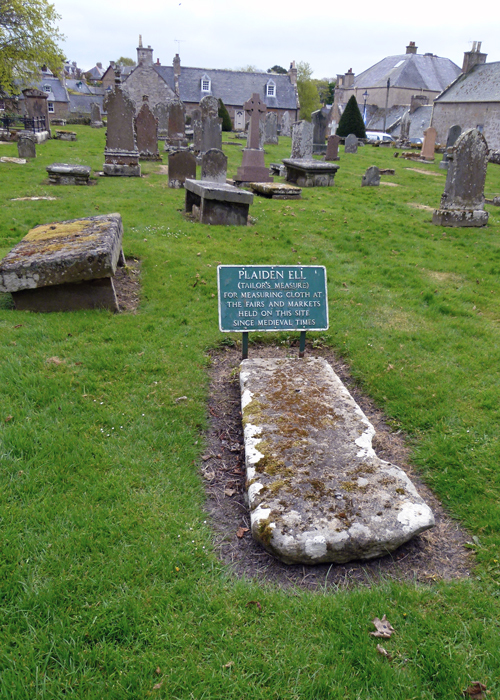 Over the wall into the kirkyard is something I hadn’t seen or heard of before, a plaiden ell. When I tell you that Dornoch’s plaiden ell is one of only three remaining in Scotland, I know you’ll be as excited as I was. As my erudite reader undoubtedly knows, the ell was a unit of measurement based on the length of a person’s arm. My trusty copy of Brewer’s Dictionary of Phrase and Fable claims that the official arm was Henry I’s of England, but that sounds unlikely (so, not trusty after all), because the ell appears to be much older than King Henry, who only died in 1135, and related to the ancient cubit, which is generally taken as the distance from the elbow to the tip of the middle finger. Still with me? In any case, there were apparently Danish, Flemish, French, Polish and Swedish ells (and no doubt others too), as well as Scottish and English versions, all of different lengths – even within their respective countries. Perhaps Brewer was being a tad parochial, then. The term ell seems to have come to us via sundry old Germanic languages from the Latin ulna, which means elbow, and the ell appears to have been a unit that came to be used primarily for measuring cloth – hence the plaiden ell. The Scottish ell was standardised at 37 inches in 1661. The English ell was 45 inches, but never standardised, the Flemish ell was 27 inches and the French ell was 54. Dornoch’s plaiden ell is apparently 39 inches. Got it? The uncertainty over length is said to have resulted in the expression, “Give him an inch and he’ll take an ell”. Scotland adopted the imperial system of weights and measures in 1824, which made things easier for everyone – unless they used the metric system. Clearly, the presence of the plaiden ell – a rod, or ell-wand, of the required length – was intended by the authorities to ensure fair trading. Another feature of Scottish markets was the tron, a public weighbeam. I don’t have the energy to go into that at the moment. Presumably, there must have been something to regulate volume as well, but I’m just guessing – and I’m not going into that either. 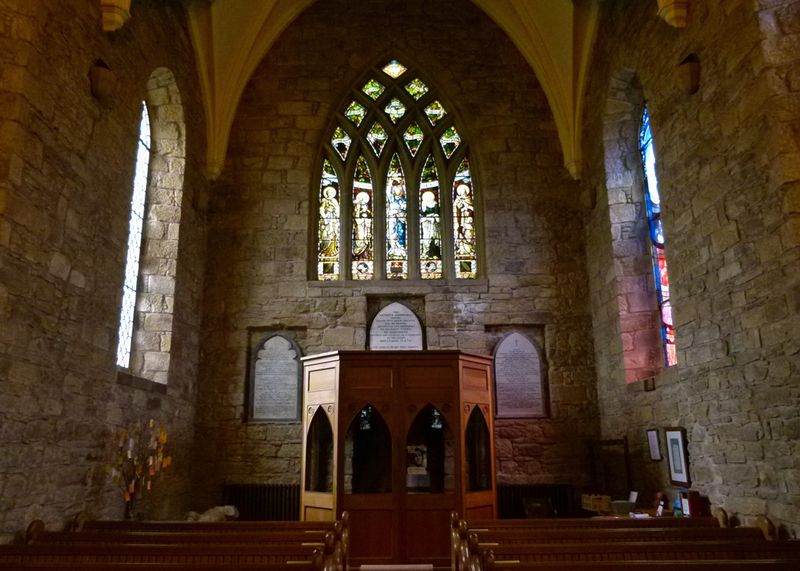 By now, you’re probably wondering where the plaiden ell is going to take us; the answer is into Dornoch Cathedral, which strikes a different tone altogether. I had been primed to expect something special from Dornoch Cathedral, but I wasn’t expecting anything unique. However, the largely nondescript exterior hides an extraordinarily interior. The first impression on opening the door was one of light. It streamed in from all directions through a myriad of stunning stained glass windows which, even given the dull day, cast a kaleidoscope of coloured patterns almost everywhere. If the decoration had been even remotely ornate, it would have been too much, confusing. But the walls are plain stone, with little adornment, a result of restoration work in the 1920s which removed Victorian plaster. A simple Gothic-style ceiling sits firmly on the walls. It is painted creamy-white, which enhances the brightness of the whole church so that light appears to radiate from all over into every corner. The thick walls and doors muffled and cocooned us from the outside; in the distance, as if from another world, we could hear the music from the market. Inside felt like the safest place on earth. 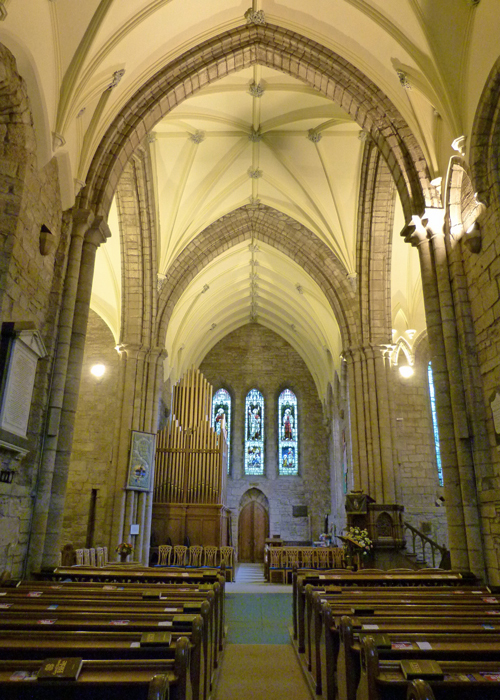 I am not a particularly spiritual man, and certainly not religious, but the beauty and serenity of Dornoch Cathedral almost made me weep; when it was time to go, I was reluctant to leave. All of this is a long way from the medieval roots of Dornoch Cathedral. What we see now in this little church – I think the second-smallest cathedral in Scotland after the Cathedral of the Isles (and I’m counting Dornoch Cathedral as being one, even if it technically isn’t) – is largely a product of the 19th and 20th centuries. There are few obvious reminders of its medieval origins and violent past. What follows is a very disjointed history, gleaned from various sources since our visit; there was nothing for the English-speaking tourist in the church itself. The builder of Dornoch Cathedral was a Gilbert de Moravia, whose family were landowners in Moray and Sutherland and who became Bishop of Caithness in 1222. Gilbert built his cathedral at Dornoch, paying for it himself, and transferring the seat of the diocese from Halkirk, further north. 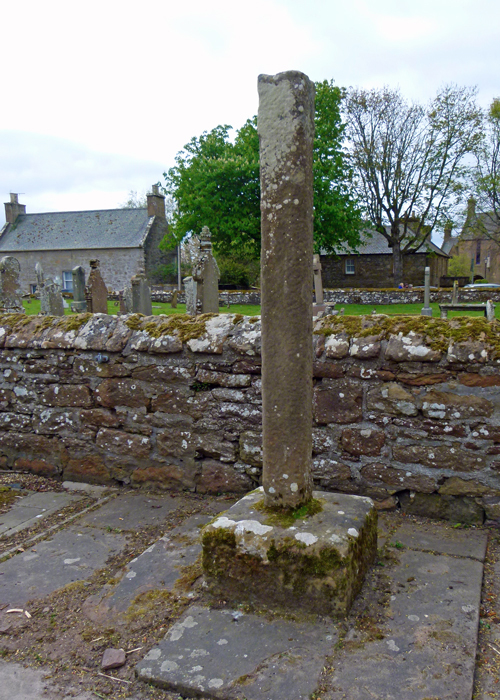 It is thought the reason for this decision was that Dornoch was considered safer than Halkirk, where his immediate predecessor as bishop, Adam of Melrose, had been brutally burnt to death. Halkirk isn’t far from the bishops’ castle at Scrabster, near Thurso, where Adam’s predecessor, Bishop John, had his eyes put out and tongue removed. So Dornoch must have seemed a far less risky location if you were a bishop. It is not known when work began on the new cathedral, but it was sufficiently advanced by 1239 to allow the first service to take place that year. The cathedral had a traditional cruciform plan, with a choir, transepts, a massive tower over the crossing and an aisled nave – somewhat different to the way it looks today, though it is still cruciform in shape. It was dedicated to the Conception of the Virgin Mary, but has been known down through the centuries as Gilbert’s, St Gilbert’s or the Cathedral Church of St Mary and St Gilbert. Bishop Gilbert probably had a residence in Dornoch, on the site of the current castle, which became the bishops’ palace, though he lived mainly at his castle at Skibo. He died at Scrabster in 1245 and was buried with due honour at Dornoch. Dornoch Cathedral seems to have struggled through the next three centuries or so without major mishap. But in 1570 a clan feud between the Murrays of Dornoch and the Mackays of Strathnever erupted into open warfare. The town was sacked by the Mackays and their allies and the cathedral deliberately set ablaze. Gilbert’s tomb was also desecrated – apparently William Sutherland of Evelix burst the old bishop’s coffin open with his foot and scattered his remains. The cathedral was almost totally destroyed, except for the chancel and transept walls. It was partially re-roofed in 1616 and used as a parish church, but was not fully restored until another two centuries had passed. This restoration was what could be described as a transformational make-over and took place between 1835 and 1837. The work was commissioned by the enormously wealthy Elizabeth Sutherland Leveson-Gower, Duchess of Sutherland, one of the most controversial figures in Scottish history, best known for the part she and her husband played in the appalling, shameful, Highland Clearances. 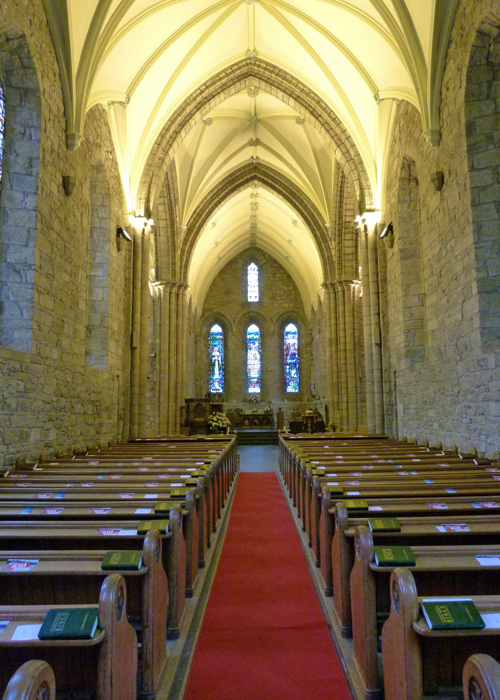 Dornoch Cathedral had been a traditional resting place for the Earls of Sutherland. As part of the restoration, a new Sutherland family burial vault was created under the chancel and there the Duchess placed her husband, who had died in 1833. There is a rumour that the Duchess undertook the restoration project in order to create the vault for the Duke and herself, but it would need more research than I have time for to discover whether there is any truth in that. In any event, she joined him in 1839 and the vault is now sealed. DURING THE SUMMER AND AUTUMN, 1942. AND HAPPY CHRISTIAN FELLOWSHIP IN THIS HOUSE OF GOD. 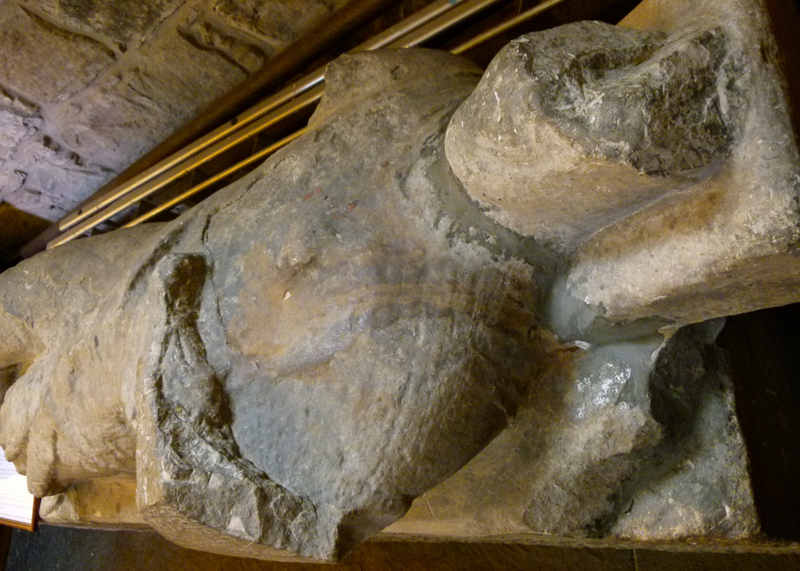 Dornoch Cathedral also has the apparently vandalised effigy of a knight on a stone sarcophagus, said to contain the remains of Sir Richard de Moravia, Gilbert’s brother. Sir Richard fought and died at the Battle of Elmo, just to the north of Dornoch. The battle probably took place sometime in the 1260s, when an uninvited party of Danes landed. The Earl of Sutherland asked Sir Richard to hold the Danish invaders in check until a larger defending force could be brought to bear – which he did and it was. Meanwhile, Richard is said to have slain the Danish leader by hitting him over the head with the leg of a horse. And that, apparently, is why the town of Dornoch has a horseshoe in its coat of arms. Among the many fine stained glass windows are three on the north side of the chancel donated in memory of the American industrialist and philanthropist Andrew Carnegie (1835-1919). Carnegie was born in Dunfermline, bought the Skibo estate in 1898 and often spent his summers there. The windows represent music, peace and literacy, three topics close to Carnegie’s heart. Not everyone approves of Dornoch Cathedral. But our visit was unexpectedly uplifting and fascinating. We have just touched on some of the history associated with this intriguing little town – and haven’t even mentioned much about the bishops’ castle, which possibly once joined onto the cathedral, or anything else much about Dornoch – like its Victorian Gaol, its beach, famous golf course – or the fact that it witnessed the last execution for witchcraft in Scotland. There is a stone in a garden, which we did not see, said to mark the spot where poor Janet Horne suffered this dreadful fate in 1727. We spent far longer in Dornoch than intended, barely managing to squeeze in the required coffee and bun before setting off to the west coast. The lesson is – never underestimate anywhere. But maybe someone will invite us back one day, perhaps to stay at the luxurious, haunted, 16th century (or earlier) Dornoch Castle Hotel…and I can find something else to write about. Somehow. A brilliant article and photos. I visited the cathedral today and was equally blown away by it and the town. Also I met lots of helpful and interesting people. A very special part of the world which I was visiting quite by chance – or perhaps not, maybe i was meant to visit such a holy site? Thank you very much – and thank you for popping into A Bit About Britain in the first place. Yes – maybe fate intended you visited Dornoch;who knows?! Thanks for this. I’m glad we don’t have ‘rooting pigs’ in our churchyard here! 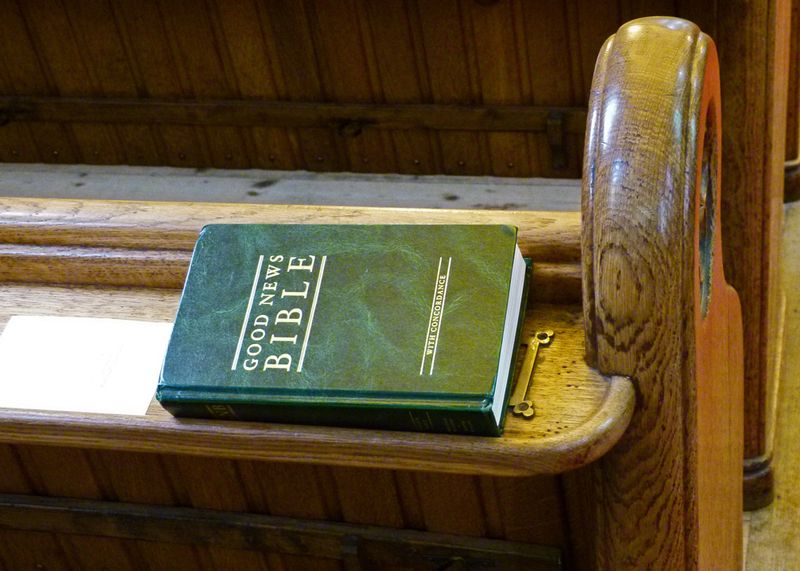 It’s good to see a copy of the Good News Bible in this beautiful place. Sadly, the Bible message of ‘Good News’ conflicts with the violent past which you so graphically describe. Happily now peace reigns here, as it always should have done. A place I haven’t visited although I’ve been in the area a lot but mainly bagging hills. Nice history. What an informative and entertaining read. Thanks also for popping in at my place. Good on Mrs Britain for wanting you to go there. It is a fascinating cathedral/church and as usual your thorough research has been interesting to read. It was interesting to hear the name Sutherland mentioned. I went to school in Sutherland and we lived in Sutherland Shire in Sydney. Your photographs of the interior of the church really show the wonderful light you talk about. Such an interesting post full of detailed research – thank-you! Fascinating history and place. I had not even heard of it! You always share things that I never really knew about and now I want to know more (since you say there is more, although I’d say this is pretty thorough!) You make me want to venture north into Scotland the next time I get to your fine country — and if I don’t, well, I’ll just have to come back! Should we ever get up that way, it’s on the list! When we were first married we lived in Glasgow and one of my friends was always going on about how wonderful Dornoch was – she went there for the summer every year with her family. Now I wish that I had made the effort to visit myself, but it was a long way from Glasgow, and even further from the Cotswolds. So many years of history. And who knew the various nationalities had such diverse arm lengths. But 54 inches? I think the French stretched things a bit. Leave it to you to find way more then you bargained for. I think I need to spend at least a year in Great Britain to see all I want to see. Plenty of interesting stuff in this post, and yet another place I am rather sure I will never visit for myself. Thanks to your blog, though, I now know about it. Interesting, how something of magnificent beauty can make us feel. I would definitely like to take in these sights in person one day. Another fascinating post, Mike. It is beautifully photographed and informatively and entertainingly written, with most impressive research. A worthy addition to your excellent oeuvre.